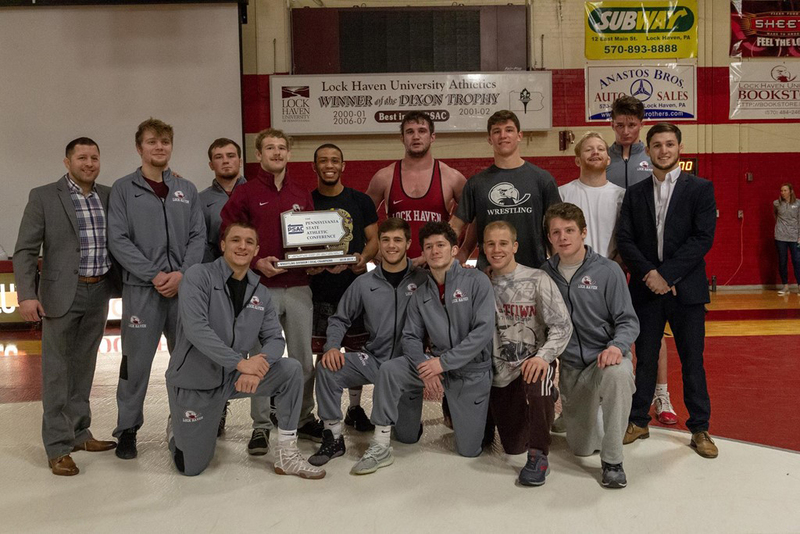 (LHU SPORTS) Members of the LHU wrestling team pose with their plaque after winning the Pennsylvania State Athletic Conference (PSAC) championship. LOCK HAVEN- The No. 22 Lock Haven University wrestling team concluded its two-match home slate with a 35-6 demolition of in-state rival Clarion. This gave the Bald Eagles a Pennsylvania State Athletic Conference (PSAC) Division I Dual Championship. Lock Haven blew by a banged up Clarion team with wins in eight of 10 bouts. LHU had bonus points in five of them, as the Bald Eagles racked up two pins, two technical falls and a major decision. This came just two days after Lock Haven defeated EWL foe Rider, 23-9, inside the Thomas Fieldhouse. Lock Haven moved to 5-0 in Eastern Wrestling League (EWL) duals, and 8-3 overall. 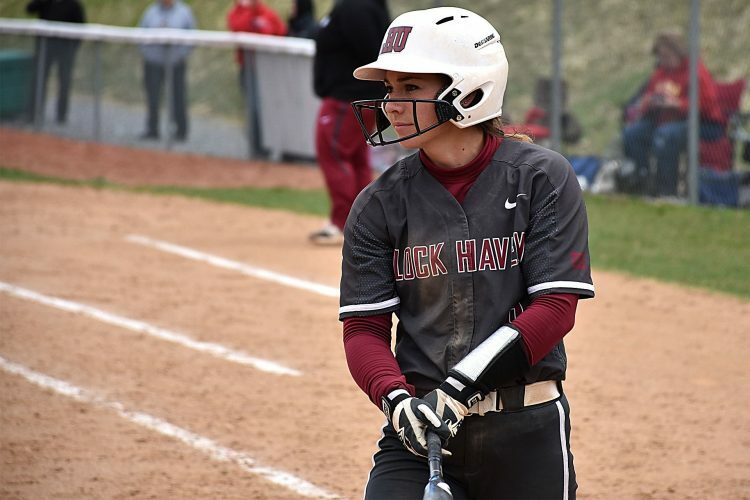 The win marked a clean sweep of the Division I PSAC teams, the first time LHU had achieved that feat in 17 years. Lock Haven previously beat Bloomsburg 36-6 in December and knocked off Edinboro 30-10 in late January. Clarion is now 3-2 in the EWL, with a 6-6 overall record. This is the first year the PSAC championship was decided via dual record. It was previously decided by team scores at the PSAC Tournament in Dec. Last season Lock Haven captured the conference crown at the tournament, giving the Bald Eagles back-to-back PSAC titles. The day was highlighted by pins from LHU’s nationally-ranked seniors. No. 5 Chance Marsteller won by fall over Evan Delong in 4:31 at the 165 spot. No. 11 Thomas Haines concluded the dual with a pin of Toby Cahill in 5:18. Marsteller, who individually moved to 18-2 on the year, feels like he’s first now hitting his stride. The reigning All-American missed some time earlier in the season, but looked spry this weekend. 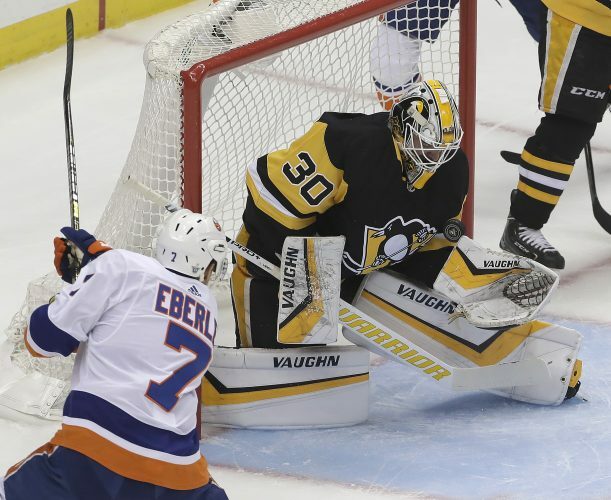 He picked up an 11-5 decision Friday against Rider’s No. 16 Jesse Dellavechia, and now has his first pin of the season next to his stat line. If Marsteller is now finding his footing, that’s a scary sign for the rest of the 165-pound weight class. After all, Marsteller had come within a point of beating Joseph. He also had a grueling battle with No. 4 Josh Shields of Arizona State at Red Lion High School on Jan. 25. Marsteller lost that one 2-1 in a tie-breaker 2. Marsteller attributes a lot of this improvement to a revitalized-training regimen. Haines, who picked up EWL Athlete of the Week honors for his 2-0 showing last weekend, also is in very good position moving forward. He has bonus points in three of his last four bouts, including two pins. Before the match the team honored the LHU wrestling alumni in attendance. That group included Clarion head coach Keith Ferraro, who wrestled at Lock Haven from 2000-03. He also volunteered with the program at Central Mountain from 2003-04. Alumni-relations are crucial to the success of the program, and Moore was happy to bring former Bald Eagle wrestlers back to campus for the weekend. 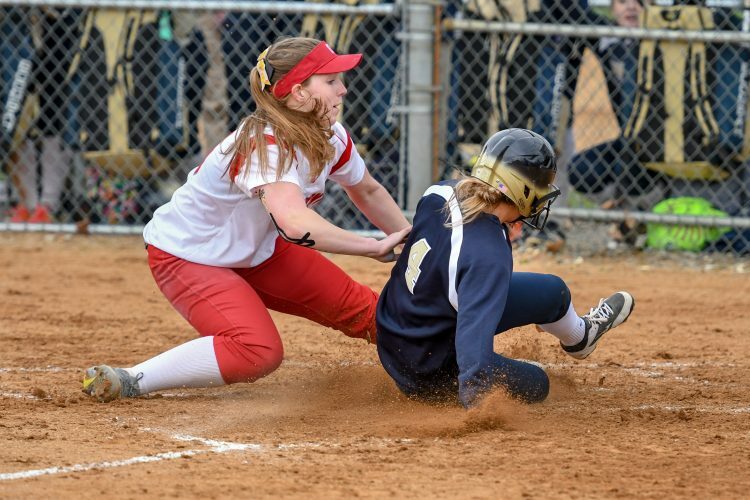 Lock Haven was expected to handily win the lighter weights and the Bald Eagles did just that. The projected starters for Clarion coming into the year at 125-149 are all out for the rest of the year. Two of those injured Golden Eagle wrestlers, Taylor Ortiz and Brock Zacherl, are reigning NCAA qualifiers. The dual started off with LHU sophomore Luke Werner picking up a 13-1 major decision over Clarion second-year wrestler Gavin Park. Redshirt-junior DJ Fehlman also picked up a decision for Lock Haven, besting former Bald Eagle Area wrestler Seth Koleno 9-5. Lock Haven gained some big distance after the 141 bout. No. 20 redshirt-junior Kyle Shoop picked up his NCAA-leading 14th tech fall of the season, topping Jalin Hankerson 16-0 in 4:12. The Shoop victory set the dual score at 11-0, and was a sign of things to come. Redshirt freshman Brock Port fought hard at the 149 spot, but ultimately lost in a 3-2 decision to Avery Shay. The Bellefonte native picked things up late in the match, as he came up with a takedown in the final 30 seconds. LHU would get another tech fall at 157, with Alex Klucker winning 16-0 over Joe Sliwoski in 3:19. The 174 bout was especially interesting, as Lock Haven junior Jared Siegrist found himself down 4-0 after the first 30 seconds against Clarion’s Max Wohlabaugh. After Moore called for a challenge on a Wohlabaugh takedown, Siegrist responded well, winning 11-6 to clinch the dual for LHU. A Lock Haven victory at 184 for No. 17 Corey Hazel followed the Siegrist win. Hazel knocked off Ty Bagoly of Clarion 7-4. After that, LHU freshman Parker McClellan faced one of his toughest tests of the year, battling Clarion’s No. 17 Greg Bulsak. The longer McClellan lost 5-0, but managed to ride out the entirety of the third period, limiting Bulsak to just a decision. Haines’ pin concluded the dual, setting the final score at 35-6. This is the fifth consecutive win for LHU over Clarion. It gives Lock Haven the chance to pull off a 6-0 EWL regular season record when it travels to Cleveland State Saturday. The team truly seems to be wrestling its best at the perfect time of the year, as Lock Haven looks to top last year’s historic postseason success.